The Farmers’ Market, is usually held on the second and last Wednesday of every month helps to support local businesses and was introduced in 2013 as part of the Trust’s strategy to improve health and wellbeing as well as helping to sustain the environment. 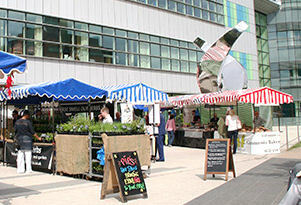 Thousands of staff and members of the public have visited the stalls since August 2013 when the market first opened, with the market showcasing the best the region has to offer. This includes eggs, breads, cheese, pies and pastries, honey, chutneys and preserves as well as exciting Caribbean foods, and tasty Indian dishes.